Why grow tomatoes from seed? There are always plenty of tomato plants for sale at local garden centers, but for the largest variety, you will need to consider growing tomatoes from seed. Since tomatoes are heat lovers, most gardeners don't have growing seasons long enough to start tomatoes from seed outdoors. To get around that, tomato seeds are often started indoors, under lights. Organic Seed: Look for certified organic seed. Disease Resistance: If you know your area is prone to a particular disease, look for varieties with built-in resistance. 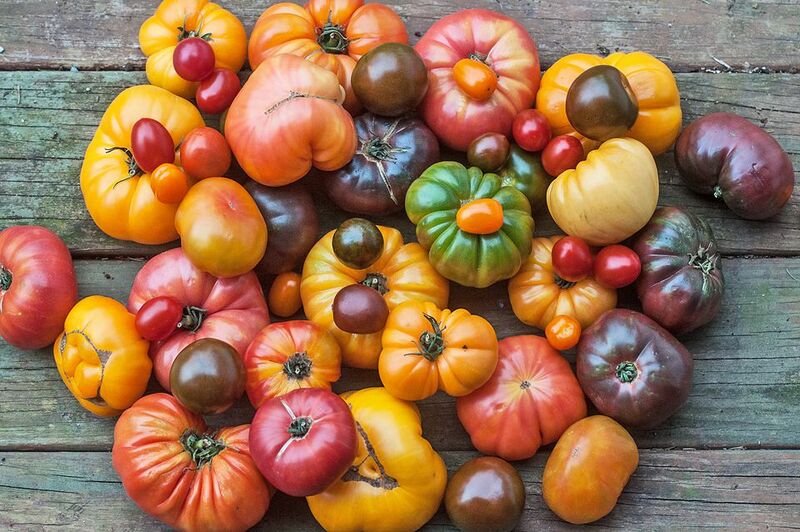 Heirloom Tomatoes: Great varieties for flavor. Plant Size: Many seed descriptions will tell you the mature size of the plant. In general, determinate plants tend to be smaller than indeterminate tomatoes. Small plants for containers often have names like 'patio' or 'pixie'. Harvest Time: If you want your tomatoes all at once, to preserve them, look at determinate varieties. ​Indeterminate types bear over a longer period; some start late in the season and some earlier. Containers: Any small pot or container, at least 3 inches deep, will suffice, as long as it has drainage holes at the bottom. Take out containers, yogurt cups and juice cartons are all options. Potting Mix: Potting mixes are blended to absorb water well, but also let the excess drain. Soil from the garden is not recommended. It usually has pathogens, not to mention weed seeds, and it tends to compact in containers. Labels: You can write on the side of the container or use popsicle sticks, plastic knives or regular labels.​ sticks, plastic knives or regular labels. Water: You'll be keeping the seedlings moist from planting on. Light: You won't have to worry about light until the seeds germinate. Tomato seed germinates fairly quickly, within 5 to 10 days. 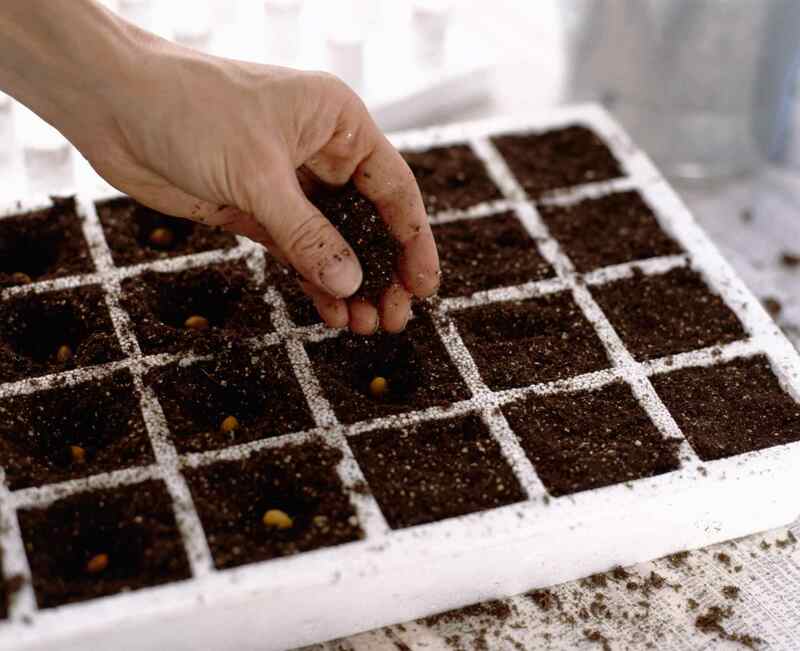 The plants also develop fast, so seeds can be started 6 to 8 weeks before you intend to transplant outdoors. Your transplant date will depend on your last frost date (determined by your USDA hardiness zone) and that year's actual weather. If you plan to transplant outdoors in early May, start your seedlings indoors in mid- to late March. Keep in mind that the warmer your seedlings are kept and the more light they are given, the faster they will grow. You don't want them to get so large indoors that you have to keep moving them to larger pots. Dampen the Potting Soil: It's easier to dampen the potting mix before you put it in the containers. Add some water and work it through. Keep adding water until the mix stays compressed in your hand, but is not dripping wet. It should break apart when you poke it with your finger. Use your label to make a 1/4 inch furrow in the planting mix. Sprinkle 2–3 seeds into the furrow and cover them with a sprinkling of potting mix. Gently firm the mix down, so the seeds make good contact with the soil. You can spray the surface with water if it doesn’t feel moist enough. Be Patient: At this point, you should place your containers somewhere warm and check them daily to make sure the soil is moist - not wet - and watch for germination. Once your tomato seedling has true leaves, it's time to start feeding it. Any good liquid fertilizer can be used once a week. Dilute it to half the label recommended dose. Light is critical now. Keep your tomato seedlings close to your grow lights and rotate the plants if they seem to be growing or leaning in one direction. Tomato stems grow sturdier if they are tossed about by the wind. You can simulate this indoors by putting a fan on your plants for an hour a day or simply running your hand through them each time you pass them. When the tomato seedlings are 2 to 3 inches tall and have a couple of sets of true leaves, it's time to pot them up or move them into larger pots of their own. You should transplant individual tomato seedlings into bigger pots, to continue growing stronger indoors. Commonly, 3- to 4-inch containers are good for seedlings this size. You may need to move them to larger pots later if you can't move them outdoors. Fill the new pots with moist potting mix, just as you did when you started the seeds. If more than 1 seed germinated in your containers, you will need to thin them. Either gently jiggle entangled roots apart or simply snip off unwanted seedlings at soil level. This ensures that you won't damage the seedling you want to keep. When to transplant will depend on your last frost date and the actual weather. Err on the side of caution; if you put the plants out too early they could be killed by a late frost or set back by a cool spell. Tomatoes planted a little later in the season will quickly catch up to earlier transplants that have been stunted by the cold. In general, when nighttime temperatures remain steadily above 50 F, it is safe to begin hardening off your seedlings. This should be about 4 to 6 weeks from when you potted up and your plants are now several inches tall, with some branching. When you are finally ready to plant your tomatoes in the garden, try and choose a cool or overcast day. Once again, plant your tomatoes deeper than they are in their pots so that new roots will form all along the buried stem. You can plant them all the way up to the top couple of sets of leaves, if possible. This is especially good if your plants have gotten too tall indoors and you want them to become stockier and stronger. If you can’t dig deep enough, you can always plant them sideways, in a furrow. The top of the plant will find the sun and grow upright in a few days. Stake the plant right after you plant it so that you don’t disturb its roots later. Give them a good drench of water and be patient, they should start flowering when the days heat up. Tomatoes can be prone to diseases of both the leaves and the fruits. The best defense is to keep your plants healthy and strong. Give them regular water, leave room between plants for good air circulation and check them daily, so that you will catch problems early.